Happy Stretch Tuesday, everyone. Cal here and I hope you are ready to see some pretty amazing candleholders tonight. Most of these ‘appeared’ this summer; clearly they were not made this summer, so they have been in existence but were not known to me. The stretch crowd is pretty excited to know about them and I hope you will share our excitement after tonight. All of these were made by Fenton and all are from the early stretch glass period. First up is a pair of #449 ‘colonial’ or ‘florentine’ candleholders in Royal Blue aka Cobalt stretch glass. 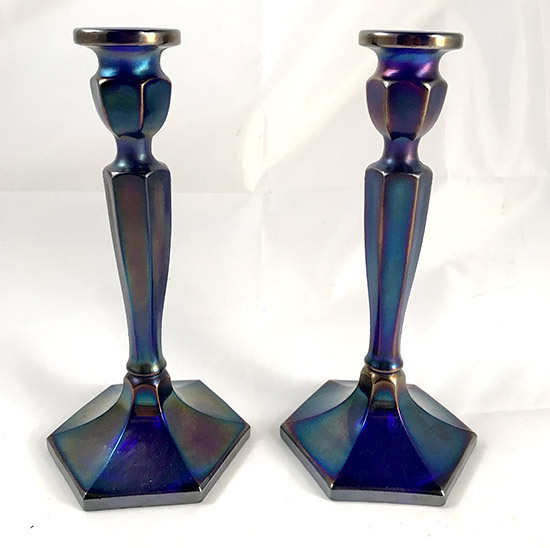 These are 8.5” tall and are extremely rare, as are any Fenton Royal Blue stretch glass candleholders. One candleholder sold a couple years ago on eBay for $50; it took until the summer of 2017 for the second one to come to light in New England. Tom and Debra Burns offered this second single candleholder in their auction at the conclusion of The Stretch Glass Convention in July, 2017. This time the single candleholder sold for $1000 plus the buyers’ premium. 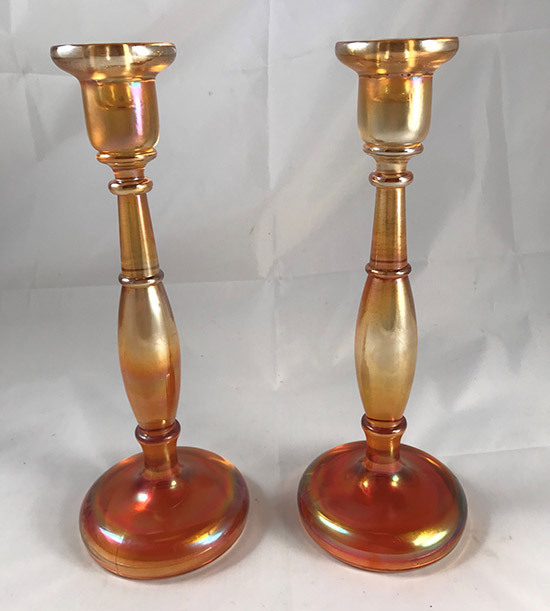 I wouldn’t begin to guess at the ‘value’ for the pair as I am not aware of another pair being offered for sale or selling, not giving us much market data for these candleholders. In fact, I’m not even aware of another pair being known, but it is probably only a matter of time until another pair or several more pair do surface as it is doubtful that Fenton made only 1 pair of these candleholders. They are beautiful to behold. 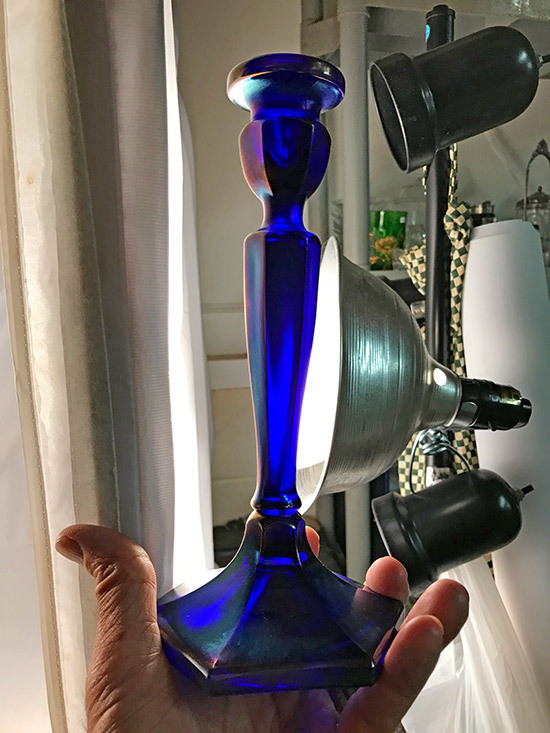 While the Royal Blue is visible in normal light, I held one up in front of a very bright light to get a photo of the actual color of the glass. Now the challenge is to find an appropriate console bowl to go with them. Anyone have one? Anyone have a pair of these in your carnival or stretch glass collection? The next two pair will be discussed together although they were not found together. One pair was in PA and the other was in WV. These are Fenton’s #549 and #649, standing 8 1/4” and 10” tall, respectively. The 549 and 649 Fenton candleholders are known in many colors including Celeste Blue, Florentine Green, Topaz, Wisteria and Persian Pearl. They are also known in a host of two color combinations, most often with a black foot, but occasionally with the foot in another iridized or non-iridized color. I am not aware of other Velva Rose candleholders from these moulds, but, again, they do likely exist and will be ‘revealed’ at some point. Maybe one of our readers has a pair or a couple of pair of these in Velva Rose? If so, we would love to know about them. Finally, I’ll share a pair of Fenton’s #749 which have been known for some time. An advanced Fenton collector had these along with a similar pair in Topaz stretch for several years. A similar pair in Celeste Blue was sold by Jim Wroda within the past two years, so we know these exist in 3 stretch glass colors. They may also exist in other colors as they are known in other colors without the stretch iridescence. These are very large candleholders; they stand 12 ¼” tall and the base is 4 3/8” in diameter. These are huge and only look ‘right’ when they are with a large Fenton bowl. I suspect there was not a lot of consumer demand for candleholders of this size AND I suspect Fenton charged a hefty price for them, adding to the already limited consumer demand. These two factors lead us to believe they were made in limited quantities, which accounts for them being quite scarce today. Speaking of the two color combinations, here is a photo of a few of them plus a solid Wistaria candleholder. Here you can see the three sizes of these “spindle” candleholders. I hope you have enjoyed seeing a few rare, or at least unusual, stretch glass candleholders. 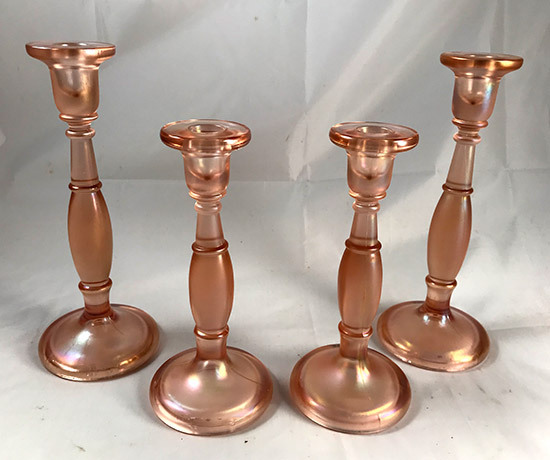 As we often do, let me say that Russell, Kitty, Dave, and the rest of the stretch glass collectors (including me) are very much interested in seeing and hearing about the stretch glass candleholders in your collections. 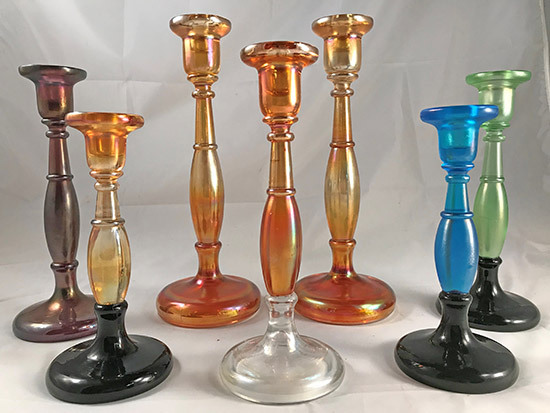 Experience tells us that many carnival glass collections include stretch glass candleholders and we are very much interested in knowing what those stretch glass candleholders might be. We look forward to you sharing some pictures of your stretch glass candleholders soon.